Tap your way through dangerous armies led by powerful Titans. Upgrade your hero and unlock new abilities. Choose your path and customize your skill tree. 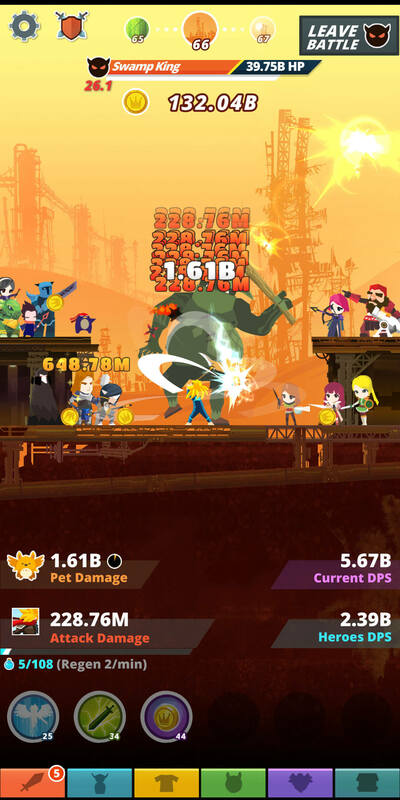 Tap Titans 2 brings bite-sized RPG on the go. It is an amazing tapping game filled with lots of upgrades and allies to unlock. You have to fend off an ever growing dangerous army led by invading Titans. The Sword Master is back to world against a stronger force of vengeful Titans and their armies. You need to seek help from new friends and save captured allies to stop the ever growing forces of evil. So, power up Sword Master and discover new strengths and abilities along the way. It is time to pick up the sword and begin a new journey. This is an amazing Tapper with simple controls as you just basically have to keep tapping to attack your enemies. You can see their health gauge at the top of the screen and after defeating 8 waves, you can face to boss. You are given a set amount of time to defeat these bosses. If you are unable to defeat them in time then it means you have to upgrade your character. You can go back to the boss by pressing the Fight Boss button. 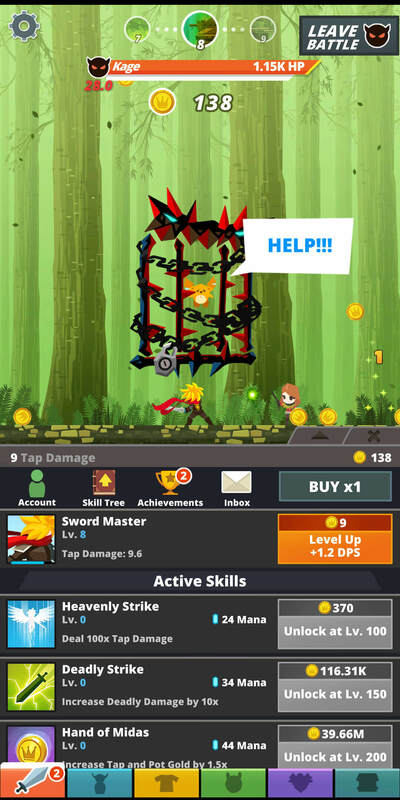 There are tons of upgrade options available but you start off with upgrading Sword Master to increase his tap damage. But as you level him up, you can buy new active skills such as Heavenly Strike that can make you deal 100x tap damage, deadly strike that increases your damage by a certain percent, Hand of Midas to make you earn more gold and many more. And you can upgrade these abilities to enhance their effects. You need to have enough mana to cast these abilities. You regenerate mana over time automatically. You can even hire allies once you progress through the stages. You can upgrade these allies to make them deal more damage and once you have reached certain levels with them, you can unlock new abilities that make them more effective in battle. These allies have unique abilities. There are some that give buffs that increase your team’s stats, give more gold and many more. There are 120 all-new Titans to conquer which are spread out in 10 gorgeous hand-drawn realms. And you even have the freedom of choosing what to invest on in your skill tree. You can choose the path of the Knight, Warrior, Sorcerer and Rogue. They all have their own fight style and you gain skill points by passing through a certain number of stages. Overall, the game is extremely fun and addicting due to the simple nature. It has a lot of upgrades for you to grind for which adds to its addictiveness. And there are lots of rewards in the game to help you progress faster. So, don’t forget to collect the daily bonus, achievements and random rewards from the floating fairies. The fairies only show up if you are connected to the internet as they require you to view advertisements to attain the rewards. You can download the game for free from Google Play and the App Store.